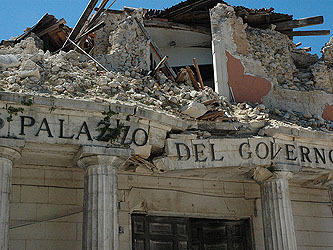 Six Italian scientists and an ex-government official have been sentenced to six years in prison over the 2009 deadly earthquake in L’Aquila. A regional court found them guilty of multiple manslaughter. Prosecutors said the defendants gave a falsely reassuring statement before the quake, while the defence maintained there was no way to predict major quakes. It took Judge Marco Billi slightly more than four hours to reach the verdict in the trial, which had begun in September 2011. The minutes of the 31 March meeting  reveal that at no point did any of the scientists say that there was “no danger” of a big quake. “A major earthquake in the area is unlikely but cannot be ruled out,” Boschi said. Selvaggi is quoted as saying that “in recent times some recent earthquakes have been preceded by minor shocks days or weeks beforehand, but on the other hand many seismic swarms did not result in a major event”. Eva added that “because L’Aquila is in a high-risk zone it is impossible to say with certainty that there will be no large earthquake”. Summing up the meeting, Barberi said, “there is no reason to believe that a swarm of minor events is a sure predictor of a major shock”. All the participants agreed that buildings in the area should be monitored urgently, to assess their capacity to sustain a major shock. Many seismologists — including one of the accused, Enzo Boschi, president of the National Institute of Geophysics and Vulcanology in Rome — have since criticized the statement as scientifically unfounded. The statement does not appear in the minutes of the committee meeting itself, and the accused seismologists say they cannot be blamed for it. De Bernardinis’s advocate insists that his client merely summarized what the scientists had told him. The prosecutor claims that because none of the other committee members immediately corrected De Bernardinis, they are all equally culpable. Even if you think De Bernardinis was culpable in some way, it’s beyond belief that six scientists were convicted merely for not immediately disagreeing with him. This is a sad day in Italian justice, and it’s going to be a long time before any qualified scientist is willing to say anything ever again about earthquake safety.